It’s early in the morning, and you catch yourself running a few minutes behind. You’re late and you’ve got a lot on your mind — your busy schedule, your commute, your next cup of coffee — everything except eating a healthy breakfast. But it bears repeating: Breakfast is the most important meal of the day, and a well-balanced diet should include morning meals. Learn about why you should make time for breakfast each morning. Eating in the morning helps your body better break down glucose, also called blood sugar. In fact, you can avoid glucose fluctuations throughout the day by eating fruit, grains, and lean protein within two hours of waking. Breakfast jump-starts your metabolism in the morning. Getting your metabolism working early helps burn calories throughout the day. Skipping breakfast tells your body to conserve, rather than burn, extra calories. 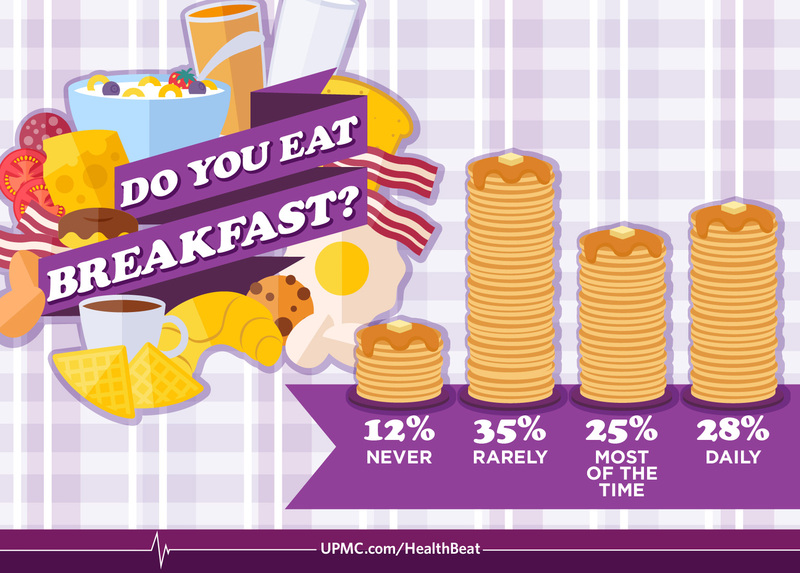 Get healthy with the help of UPMC Nutrition Services. Breakfast energizes the body. People who eat breakfast show an increase in physical activity throughout their mornings than people who skip it. Activity helps prevent weight gain and fatigue. Eating breakfast can actually give you a mental edge. Stable glucose levels can help your ability to focus, reason, and process information.